Using wool from heritage sheep she raises in the Northern Netherlands, Dutch designer Claudy Jongstra creates visceral landscapes of texture and color. 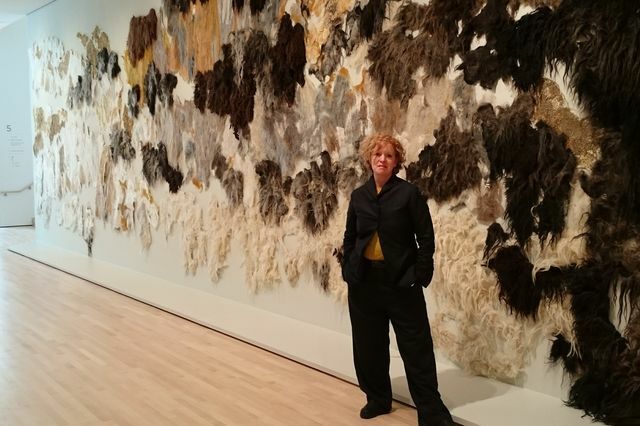 For Aarde, a monumental, site-specific mural installation at SFMOMA, Jongstra applied Bay Area minerals to hand-dyed wool. This large-scale textile mural works in evocative contrast to the hard-edge materials of the museum’s building, creating a unique passage that marks SFMOMA’s architectural history through the designs of architects Mario Botta in 1995, Mark Jensen in 2008, and Snøhetta in 2016.